So what, you may wonder, would happen if, say, two seventy-somethings, two fifty-somethings and four twentyish-somethings all went up to the BWCAW together for a three night stay? Allow me to enlighten you. Hubby applied for a permit last winter, and people are picked by lottery. There is a limit to the number of people who can go in one group, and if you want a specific time, you have to request it. We got the permit and the time slot we wanted, and the planning was under way. Hubby and I went to the BWCAW twice, the first two summers we were married. The last time was 24 years ago. His parents have been there many, many times and, as a result, have years of notes from trips, lists of equipment and food they took, menus from meals, and so forth. This wealth of information was where they and hubby began. 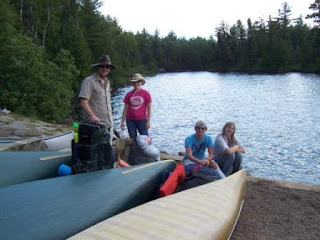 We got our group together: In-laws, hubby and me, our son and his fiancee, our daughter and her best friend, four canoes. The Oklahoma contingent had a twelve hour drive to get to the in-laws, and the van was loaded down. The day after our long drive was for packing and loading. Which looked something like this. A couple of us also set up our tents because they were new, and we didn't want any surprises once we got there and attempted to set up camp. We set out early on Friday morning, heading north, the direction of Lake Gitchee Gumee. We made one stop in Hinkley for some famous Toby's doughnuts. Farther north, Tofte is the city where we got off the beaten path, picked up our permit from the ranger station, and headed the 25 miles to Sawbill Outfitters, where we would eat lunch, rent canoes, and shove off. We had a brief lesson on how to portage the canoes from one lake to the next. Here are the kids putting their newfound knowledge to good use. We hauled the canoes and all our gear down to the water's edge. After another brief lesson on how not to tip the canoe and send all your gear and food and clothing into the drink, we were off to conquer new worlds and seek new adventures. Excitement and anticipation were high, particularly in the four youngest members of the party. Little did they know - DUN DUN DUN - what was waiting down the trail. Down that trail, back up, and down again, and back up.. Cont'd. Was an uber fun time though. trev - Yes, it was. Most of it . . .
We had a great trip and thanks to Bob & Clare for mentoring. All in all an outstanding trip. I like your write-up and look forward to reliving more of the trip through your blog! randy - Hey, a comment! You also did a lot of the work for that trip to make it nice for everyone. 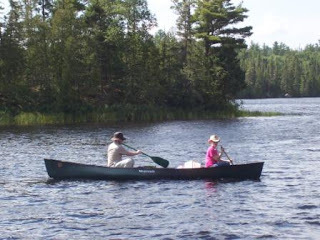 About three minutes after the last picture was taken (the one of me and Christina in the canoe), Grandma and Grandpa pointed out that we were seated backwards in the canoe haha so we had to go back and switch. That and what do you think of my kickass hat? curt - Yeah, I'd forgotten you guys started out bass ackward in your craft. I love both your hats! All I know is that I wore my good clothes for about a week waiting to go out with your gang! I told you my whole life has been waiting for women to show up. Glad you had a great time on your brief vacation. Were the mosquitos waiting for you up in the woods? Sounds exciting. Can't wait to hear the "rest of the story". bill - You will be happy to know that the mosquitoes were so horrible they paid me back for you having to wear your good clothes. I will mention them in a future post. The mosquitoes, not your clothes. tracy - It is a truly interesting adventure.